Paul Haynes built the hotel for Frank Groe in 1892 on the south corner of Mashell Avenue and Groe Street. 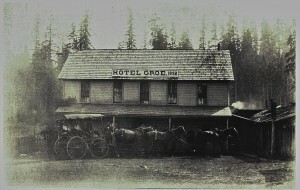 It was then called the Pioneer Hotel. The 20 x 40 building, with eight bedrooms, was constructed solely of split cedar boards, nailed up and down onto a frame of hewed poles. There wasn’t a foot of sawed lumber throughout the entire building. (History of Southeastern Pierce County). 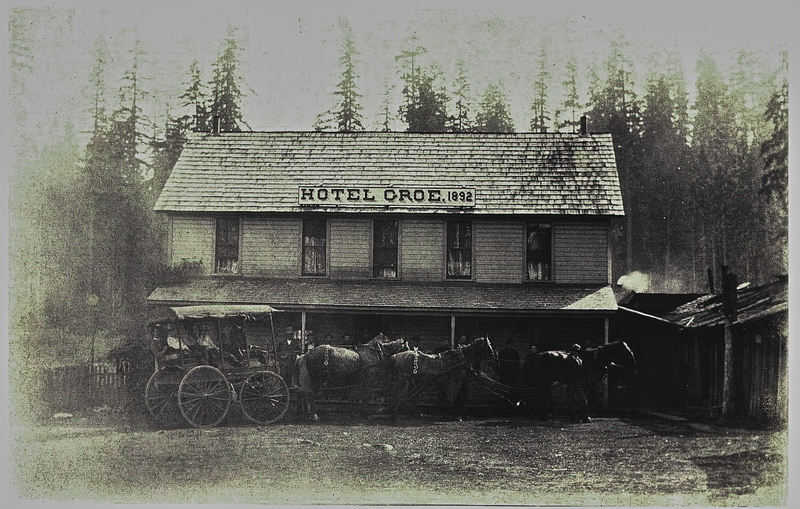 The Groe’s hotel was multi-functional. The first church wasn’t built until 1912, so the first public services were held at the hotel. The hotel caught fire several time, and the townsfolk were able to put it out. But eventually the place went down in flames.